Hello and welcome to the website of the German Sim Mod Foundation. This website will give you various information about the team and it's work. I will frequently add new things here so come back from time to time and discover the new projects. I hope you like the site and enjoy your stay! 04.06.2008 Wirefusion presentations added to the gallery. Today I added two wirefusion presentations to our gallery. One shows the new Porsche GT3 RSR (WIP) how it looks at the moment. The other one shows our Porsche 911 GT3 Cup. Open the presentations just by double clicking the thumbnails. Enjoy both cars in 3D here. 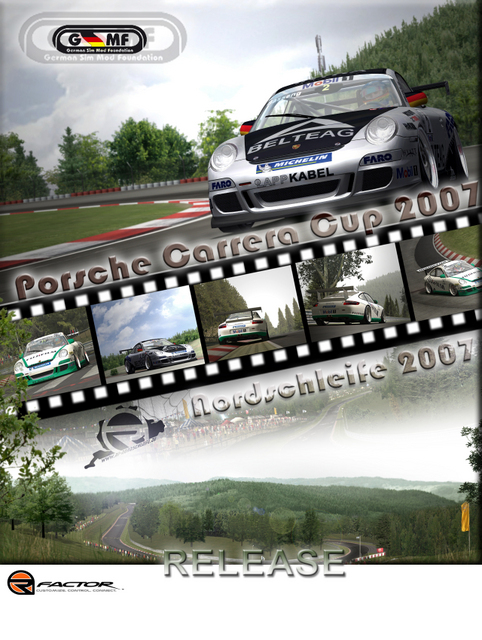 16.05.2008 First screens of the Porsche 911 GT3 RSR. Today I added the first two render screens of the Porsche 911 GT3 RSR to our gallery. You can enjoy the two screenshots here. After 1 1/2 years of developement GSMF proudly presents the PCC 2007 Mod! This mod includes the Series of Germany, Asia, Australia and the Mobil1 Supercup, Support Series of the FIA Formula 1. You can choose between the different series but only the Supercup Series has the PCCB (Porsche Ceramic Composite Brake). In the "Carrea Cup Series" you have all 4 series in one (designed for online racing). They are using all the normal steel brake disc system. Physics have been developed in cooperation with the real PCC-Driver Ralph Kalaschek and his team MRS Racing. We hope you enjoy racing with this new mod made by German Sim Mod Foundation. Because of the high details of this mod, we recomend all users of graphic cards with less than 512 MB video memory to use the low-res Skins. In the last days I added some nice background pictures for Lupo Cup 2003, PCC 2005 and PCC 2007 as well as a new description for PCC 2007. Pictures are taken by Stephen O'Malley. Thanks to him for the nice screens. Today I added new pictures of PCC 2006/2007, PCC 2005 and VW Lupo Cup 2003 to our gallery. All pictures are taken by 00malleys. Thx a lot to him for these awesome screenshots. You can enjoy the new screenshots here.